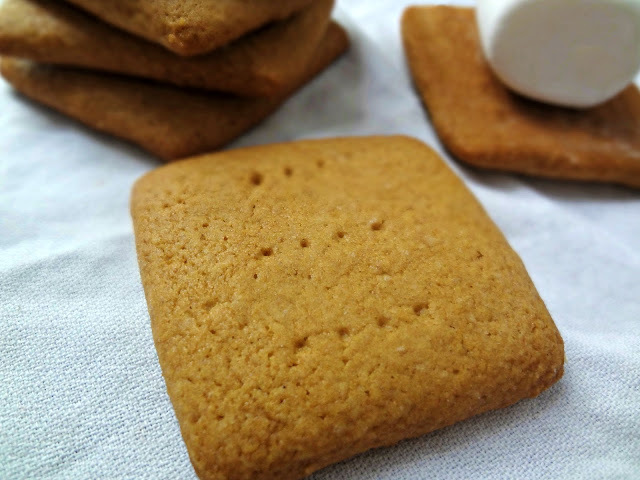 Adapted from Annie's Eats "DIY Graham Crackers"
Makes about 4 dozen 2 in. squares. 7 tbsp. (3.5 oz or 100g) unsalted butter, cubed and frozen 20-30 minutes. Line baking sheet(s) with parchment paper/silpat. Combine flours, sugar, baking soda, and salt in a food processor. Add cubed butter and pulse until they are pea-sized and the mixture resembles course crumbs (you can also use a stand mixer, pastry cutter, or 2 knives if you don't have a food processor to cut the butter in). In a measuring cup whisk honey, milk, and vanilla together. Add to the dry ingredients. Process until a sticky dough comes together. Form the dough into a disc and cover it with plastic wrap. Chill dough for at least 2 hours, until firm. Generously flour a work surface. Flour dough and roll out to about 1/8" thick. Re-flour as needed. Using a cookie cutter, pastry cutter, or a pizza cutter, cut the dough into your desired shape. Re-roll and re-chill as needed. 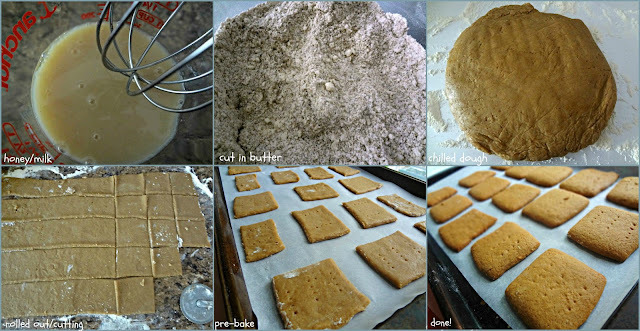 Transfer cut dough onto prepared pan(s) and space 1-2" apart. Chill cut outs until firm (30-45 minutes in refrigerator or 15-20 minutes in freezer). Using the blunt end of a wooden skewer, or a fork, you can poke a dotted pattern into the top of the chilled cut outs, if desired. Bake until evenly browned and just crisp, 10-17 minutes. Cool on the pan briefly, then transfer to a wire rack to complete cooling. 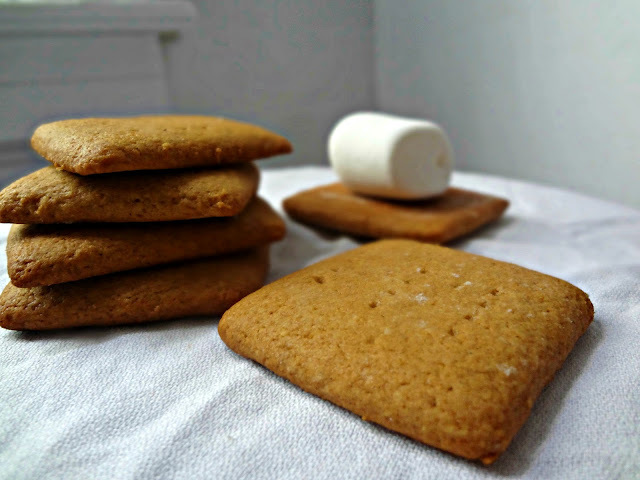 Use for s'mores, crusts, other recipes, or just eat them as is!